Our water resources benefit the entire community in many ways, aesthetically and financially. They contribute to the quality of life we enjoy in Haywood County. 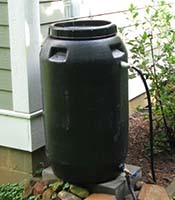 Everyone can be a part of the local effort to help protect and conserve our water resources. Become involved with us, tell a friend, and include Haywood Waterways on your list of charitable giving. We have experts available to help with planned giving and estate planning programs. Let's keep Haywood Waterways a strong, successful organization now and into the future. Our children and grandchildren will thank us. Make a donation in the amount of your choice. 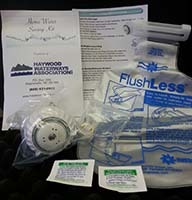 Includes a Shower Pro Massage low-flow showerhead, toilet leak detection non-toxic tablets, toilet displacement bag, bathroom faucet aerator, and installation instructions. Haywood Waterways is a member-based organization. Approximately 20% of our budget comes from member dues and donations and 60% comes from grant funding. The remaining funds come from earned income, investment interest, and other sources. For every dollar raised through dues and donations, we leverage $25 from grants and other sources! Donors have the option to make an unrestricted donation, or support one of three special funds we have established. 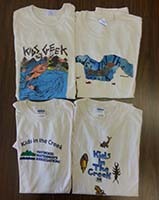 Kids in the Creek is Haywood Waterways' premier education event. It is a hands-on learning experience about water, and includes opportunities for students to get in the river, flip over rocks and learn about the many creatures living in the Pigeon River. In the event's 21 year history, Haywood Waterways has reached nearly 14,000 8th grade students. It is consistently one of the more memorable experiences students have from their final year of middle school, and is an important tool for teachers. As one teacher said, "Kids in the Creek does more to increase students understanding of water and water quality than anything I could do in the classroom. It has been a valuable learning tool for many years and something the students and I look forward to every year." In memory of Joetta Rinehart, one of our greatest supports and volunteers, the endowment fund will support the organization and significantly reduce our reliance on grant funds for administrative and operating costs. Our goal is $2 million. The fund is held by The Community Foundation of Western North Carolina. The Water Restoration Fund provides fast access capital to implement small-scale stream restoration projects. We frequently encounter these opportunities that directly benefit water quality and wildlife, such as riparian plantings, rain gardens, and small-scale stream bank erosion control measures, but do not have the right grant funding in place. Eligible projects will typically range from $1,000 to $10,000. In the past, funding typically came from large 319 Program, Clean Water Management Trust Fund, and Pigeon River Fund grants. However, the grant application process takes time and is not guaranteed. Having quick funding access will expand our abilities and help donors have direct impact on water quality. We've lost track of how long we've hosted this event but it's been over 15 years. This annual event benefits our organization and programs. In recent years, it has been part of PlottFest and cohosted by HeadStart and Trout Unlimited-Cataloochee Chapter. The "trout" are carved wooden replicas that are released into Jonathan Creek for a race to the Maggie Valley Fairgrounds. The first several fish across the finish line win a prize. Special thanks to Maggie Valley Restaurant for covering the ticket printing costs every year, each one has a 10% off coupon to the restaurant.